An Oregon-based author has just released her first book. “The Truth is at My Front Door,” by Ilene Cummings, offers women a look at inner developmental qualities all women have, which the author states are guaranteed to assist in a woman’s quest to age with dignity. What’s more, the book is told through the personal experiences Cummings has gone through in the aging process. "Front Door" directs readers through themes and challenges one faces in the process of aging well. Instead of focusing on attempting to avoid aging, the book focuses on the “quality of beauty within every woman.” Fourteen stories comprise "Front Door," each offering lessons and insight on how to age beautifully. Cummings has been focused on the aging process for more than 40 years. She began her journey with learning about the aging process after getting a job as founding coordinator of a Woman’s Program at her local community college. From there, Cummings was able to expand her innate qualities of compassion, empathy and human understanding – all of which were put to great use in helping understand women. 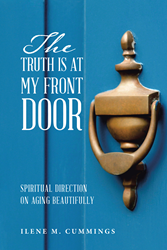 “The Truth is At My Front Door” is about powerful inner capacities which will lead to aging beautifully. For more information about the book and Dr. Cummings, please visit http://www.truthatmyfrontdoor.com/. Available at Balboa Press, Amazon and Barnes & Noble. Dr. Ilene M. Cummings is a human development counselor who began her career as coordinator of a Women’s Program at her local community college. She is responsible for establishing the Center for Adults in Transition, a human growth and development program in New Jersey. Currently working on a poetry book with themes such as love, grief and healing, Dr. Cummings resides in Eugene, Ore.